I know that’s probably a bit of a long name for these cookies, but I really couldn’t think of anything more appropriate. I’ve been making these cookies since I was old enough to hold a spoon and mix thick batter. One of my favorite childhood memories is dragging out the big yellow Tupperware bowl from our cupboard, searching for the recipe in my mother’s over-stuffed recipe book and baking up these cookies with my mom on a Saturday morning. She spent a lot of time swatting my father’s hand away from the bowl as he tried to steal spoonfuls of raw cookie dough (and since she was distracted fighting him off, I’d slip in extra chocolate chips – because you can never, ever have enough chocolate chips in your cookies). Try these out…I know you’ll love them. Blend together butter, brown sugar, granulated sugar, eggs and vanilla extract in a large bowl until very smooth. Add salt and stir well. Add baking soda and mix. Gradually add in flour and mix well. Pour in chocolate chips and stir until spread evenly throughout the dough. Drop dough by tablespoon portions onto an ungreased baking sheet (they do spread as they bake, so I usually put 12 tablespoon portions per baking sheet.). Place cookies on the center rack of the oven and bake for about 10 minutes until lightly golden brown around the edges. ***Here’s the trick to achieving perfectly soft cookies that melt in your mouth – only cook them until they’re lightly golden brown around the edges and still look ever-so-slightly under cooked in the center of the cookie. When you take them out of the oven, they continue to cook for a couple minutes or so on the hot baking sheet. Trust me, they’re done….any longer and they’ll be overcooked. Let the cookies rest on the baking sheet for a few minutes and then transfer to a cooling rack. when I time mine right I do the same thing. let them finish off on the sheet (while i get screamed at for Cooooookkkkkiiiiieeeeessss)and they are just divine that way. Folks, I remember these cookies. I also remember debating who had the better recipe. In the end we both won, because we were both stuffing our faces with cookies. I have MANY happy memories of baking (and eating, of course) chocolate chip cookies together :). I’d love to know if you liked them!!! 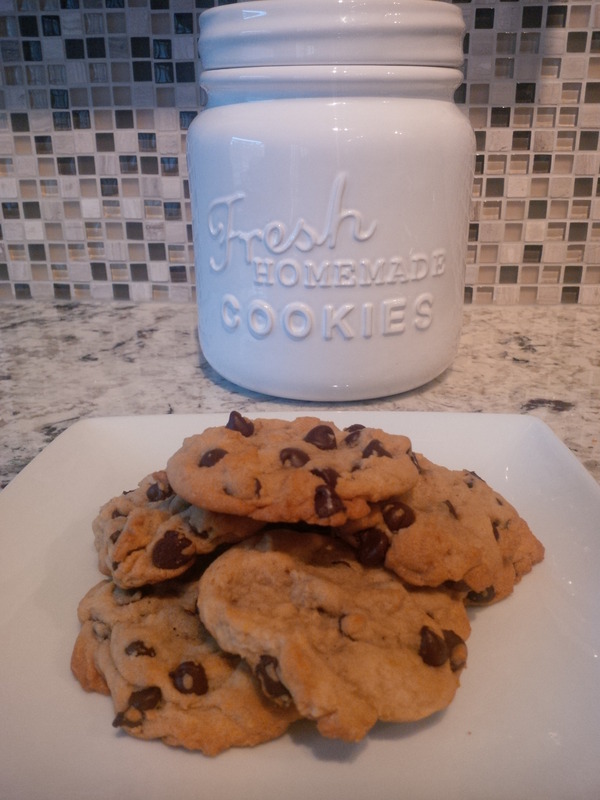 i just made them for my kids this week (and for me)…you really can’t beat warm chocolate chip cookies straight out of the oven ;). I’ve always added a brick of cream cheese to each batch of cookies so they stay soft and don’t brown! Don’t eat the raw dough though, you’ll gag. Oooh! Thanks for the tip! I’ll have to try it next time…..